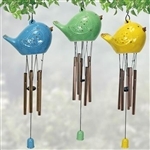 These whimsical bottle bell chimes are crafted of hand glazed porcelain and metal - and make a colorful addition to your garden or patio. Specifications: 2.75"x2.75"x8.5". Please select color, (if you can choose just one:) Otherwise, at these prices, why not buy all three? Personalized Ceramic Family Cookie Jars are the classic heavy, tightly sealed ceramic jars of the past with updated style to complement any home. Fun, family, love and more. The classic shape and smooth, clean lines make this canister suitable for any décor, from country to modern. We offer 3 adorable designs to choose from: "Bless Our Home", "Family Cookies" or "Family Initial"
PERSONALIZATION: Enter up to 12 Characters for family name.